Line Upon Line. First Street Studio. Austin, Texas. September 28, 29, & 30, 2018. A republic of spaces (world premiere) and I, for example, …, plus performing with the trio in Richard Barrett’s Codex XIV. At the moment, I’m finishing a new quartet (tenor saxophone, trombone, piano, and contrabass) for ELISION, which is scheduled for a premiere in Taiwan in May 2019 and shares its title with a collection of six overpainted photographs by Gerhard Richter, Self-Portrait, Three Times, Standing (15.3.1991–20.3.1991). And in September I also have the first development session in Cologne for a new work for Musikfabrik (tentatively scheduled for a mid-2020 premiere, for alto flute, English horn, contrabass clarinet, and cello) titled A way of making ghosts, based on this amazing self portrait, also by Richter. The two works are, in a sense, companion pieces. The two self portraits—as with much of Richter’s work—raise fascinating questions about the relationship between abstraction and representation. In the overpainted series, the ‘real’ of the image of the photograph is obliterated by the reality of paint, reorienting the sense of ‘material’ from the representational image to the physical surface of the photograph itself to the overlaid paint and the physical reality of the paint’s viscosity, colour, and texture, and finally to the physical reality of Richter’s squeegee technique, pulling that paint across the surface … that is, from person/place to replication to matter to mechanism. 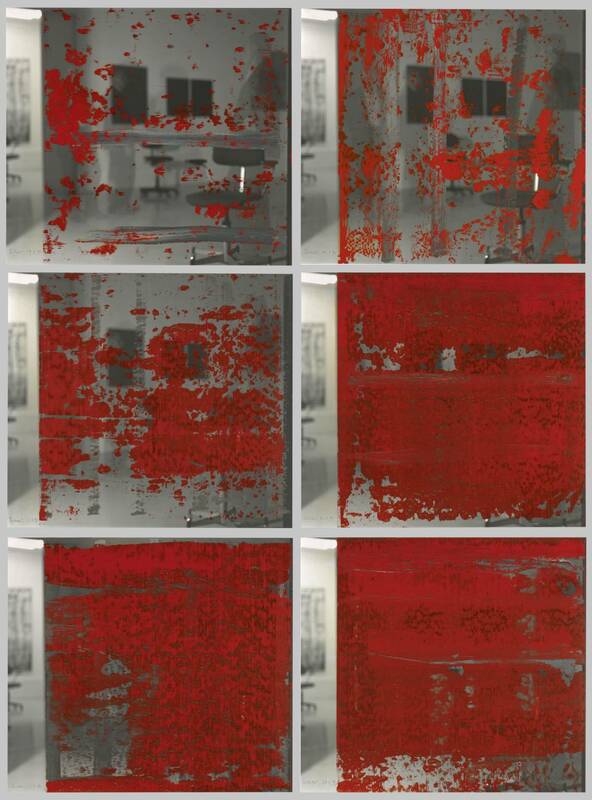 It’s important, too, that the red surface here is unpredictable, unconstructed—it is result, aftereffect. 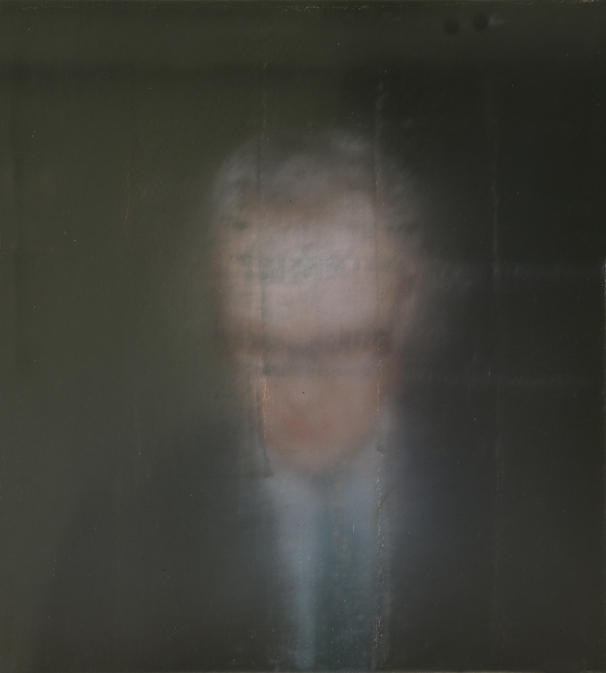 The ‘reality’ of the ‘original’ image itself is, too, made abstract: the image is a triple exposure, with Richter present in three different poses, again taking something very real—the artist in his studio—and, through a very simple process of layering, turning the image into something unreal, abstract, distant, ghostly. Then the obliteration of that process takes over; the delicate, hazy image becomes memory through the simple violence of painting, and it’s unclear which of these layers of activity best evokes the ‘self’ of the title. In the 1996 self portrait, there are similar issues, but they manifest in quite different ways. The representational element here is of course much clearer. The image is based on a photograph (from Richter’s sprawling Atlas collection), and I’m fascinated by the way in which the cropping and rotating of the original image completely alters the emotional state that is projected in the painting. As with so many of Richter’s more intimate portraits, the subject’s gaze is deflected, hidden, obscured. The face and its details are all just out of reach, present but not visible. What I love about the self portrait is that it is personal and vulnerable but also somehow quite distant, not least because of the blurred, smeared surface (and perhaps even more the weird overlaid grid, which reveals the painterly ‘surface’ of the painting and distances it from the ‘image’ of the painting … similar to the overpainted photographs, in which the paint reveals the inherent flatness of the actual physical surface of the photograph while somehow intensifying the sense of perspectival depth/distance in the photograph’s image). Both of these new works explore similar issues, dancing between the representational and the abstract, between obliteration as covering and obliteration as revealing the reality of instrumental and bodily material, between intimacy and separation, between vulnerability and otherness, between layering as stacking/extending and layering as concealing/hiding. And both new pieces continue a path I’ve been exploring in my work over the last 2-3 years, rethinking where ‘I’ sit in my work, and reimagining the personal, the evocative, and the expressive aspects of how and why I make pieces. To that end, the pieces are also mirrors of each other—somehow appropriate with the notion of the self-portrait—one external, outward, explosive, expanding, the other inward, reflective, closed, internal, but both built on the same reflections.